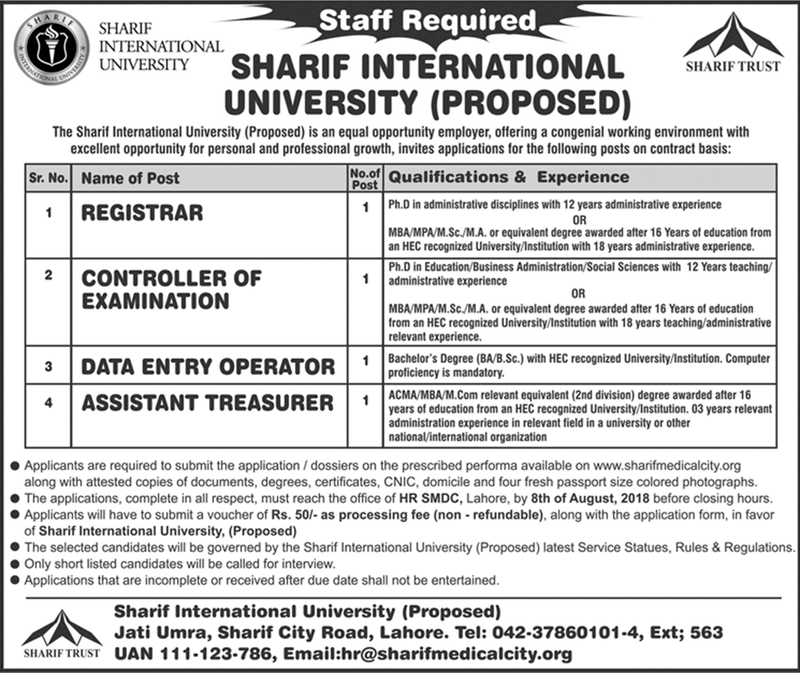 Sharif International University Lahore Punjab. PhD in administrative disciplines with 12 years administrative experience OR MBA/MPA/M.Sc/M.A, or equivalent degree awarded after 16 Years of education from an HEC recognized University Institution with 18 years of administrative experience. PhD in Education Business Administration, Social Sciences with 12 Years teaching administrative experience OR MBA, MPA/M.Sc/M.A. or equivalent degree awarded after 16 Years of education from an HEC recognized University Institution with 18 years teaching administrative relevant experience. Bachelor's Degree (BA/B.Sc.) with HEC recognized University Institution. Computer proficiency is mandatory. ACMA/MBA/M.Com relevant equivalent (2nd division) degree awarded after 16 years of education from an HEC recognized University Institution. 03 years relevant administrative experience in relevant field in a university or other national-international organization. • Applicants are required to submit the application/dossiers on the prescribed performa available on www.sharifmedicalcity.org along with attested copies of documents, degrees, certificates. CNIC. domicile and four fresh passport size coloured photographs. • The applications, complete in all respect, must reach the office of HR SMDC, Lahore, by 8th of August, 2018 before closing hours. • Applications that are incomplete or received after due date shall not be entertained. Jati Umra, Sharif City Road, Lahore.